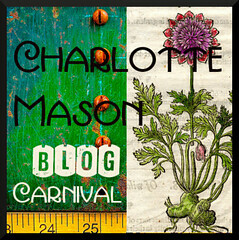 Welcome to the latest edition of the Charlotte Mason Blog Carnival! Homeschooling today may look different on the outside than it did back when Charlotte Mason was alive on the earth. But, when you get to the heart of homeschooling, the nitty gritty of teaching children, it comes down to just a couple of things that have remained the same. Choosing good books to expose your children to during their growing years and then offering those books in a way that make them reach their hearts. Here is an entry from my archives: Forming a Good Question: A Different Kind of Narration. In this post I share how I applied one of the thoughts in the How To Use School Books section of Volume 3. I would also invite you to read this important post from my archives: Is It Me Or Is It Them? Charlotte Mason’s Ideas to the Rescue. I hope you find my revelation helpful in your family. “We have worked on habits and made a good base for our current studies. They know how to read and write with confidence. All along the way we have encouraged them to think and ask questions. Now as teenagers, they are going to be expected to work a little harder, to “make judgments and discriminate”. Mama Squirrel from Dewey’s Treehouse shares the first installment based on the carnival’s topic: Using School Books With Charlotte Mason. In this entry she gets right to the heart of the matter, sharing a few points that shed some light on the application of the information in Volume 6. I invite to read a thought from her article below and then continue to read for gems to apply in your family. Next there is a post from Carol from Journey and Destination: French Lessons, Vocabulary and Folk Songs. In this post, you will find some practical tips and resources to use with your family, including her French Notebook. Now for Anne White’s entry from the Archipelago blog: Making Sense of Everybody’s Learning. She shares some thoughtful reflections on the book, Making Sense of Adult Learning. Celeste from Joyous Lessons is hoping you enjoy her entry: Nature Study Outing-Tiny Finds at the Park. They found some new things to learn about on their refreshing nature outing. Our family enjoyed has enjoyed keeping track of our summer birds. I invite you to pop over and read all about it on the Handbook of Nature Study: Summer Bird List 2014. My friend Amy Maze over at Living and Learning is hosting a Charlotte Mason themed link-up. Participants are reading through the Home Education book by Charlotte Mason. I invite you to pop over and take a look at each of the chapter’s discussions. The next edition will be at Simply Charlotte Mason! 1. Don’t just add places to a map as part of a geography project…pick one of those places and research it. Share your work with the whole family. 2. Use notebook pages for customized learning about a geographical location. 3. Keep a large world map in plain sight to refer to as often as possible. 4. Include a study of the plants and animals of a country when completing a geography project. Children are naturally interested in animals from far away places that are different than your local creatures so let them use that as a way to learn about geography and habitats. 5. Use geographical references when going places and taking hikes. Your local geography is just as important as learning about places far away. Renaissance art is a joy to offer to our children and a time period rich in great artists. Every child should learn to recognize the famous paintings of Leonardo Da Vinci and Michelangelo! When children start at a young age to view great art, they develop an appetite for more as the years go by. I found a mini-unit stuck away in my archives that I would love to share this week. I updated a bit of the information and it is all ready for you to download, print and share with your family. You will find printable art prints (small size), a mini-book about Renaissance art, a notebooking page, and two coloring pages in this Renaissance Art mini-unit.